The Company has also purchased leasehold interests from Gallatin Resources, LLC (“Gallatin”). In 2008, the Company purchased leasehold interests from Gallatin for a total consideration of approximately $22,109. In 2009, the Company paid Gallatin a total of $22,223 related to previously acquired leasehold interests. In 2010, the Company paid Gallatin a total of $15,822 related to a previously acquired leasehold interests. Carter Stewart, one of the Company’s directors, owns a 25% interest in Gallatin. Legal counsel for Gallatin informed the Company that Mr. Stewart does not have the power to control Gallatin Resources because each member of Gallatin has the right to vote on matters in proportion to their respective membership interest in the company and company matters are determined by a vote of the holders of a majority of membership interests. Further, Mr. Stewart is neither an officer nor a director of Gallatin. As such, Mr. Stewart does not have the ability to individually control company decisions for Gallatin. The Street Sweeper has published Part II on Northern Oil and Voyager Oil. I have been sitting on this post for while pending the publication of an article by Mellisa Davis (of The Street Sweeper). She has now gone public quoting me - so here is something I have been working on. Until the crisis one of the staples of my life was financial institutions which under provided for inevitable losses and grew really fast. Examples include Metris and Americredit - both of which collapsed, partially recovered and were eventually taken over. Before the collapse they had less-than-prime lending businesses in credit cards and auto loans respectively. Metris was the more pure example. Another example was the credit card business of Circuit City. These companies understated losses. That made them seem profitable. That profitability is only temporary because eventually it becomes obvious to even the most stubborn and blinkered management that the loans are not going to pay. When that happens a charge is inevitable - and future profitability winds up at a lower level (more akin to economic reality). However the companies in question deferred the day of reckoning. They did this a couple of ways. First when someone could not pay their loan they tended to extend them more credit. Metris’s average balance outstanding went above $4000 (or more than double average balances at similar companies). That meant that when the losses (inevitably) came they were bigger. The second way that they deferred the day of reckoning was just to grow really really fast. After all, if you don’t recognize any losses on new loans, then filling your portfolio with new loans meant your aggregate credit looked OK, even if the old loans were toxic. The denial solution de jour was hypergrowth. The hypergrowth hid problems and also (incidentally) drove stocks to the moon giving management ample opportunity to cash out. In other words the path that made management rich was to make the problem bigger and bigger. Sometimes before they blew up (and they inevitably blew up) you would get a signal: a quarter with an unexpected “reserve adjustment”. Reserve adjustment being a (belated) admission that the reserves were not adequate. Sometimes there was no signal except insider selling. Mostly even the insider selling was not a good signal because the insiders were always selling. There is a lesson I drew from this. 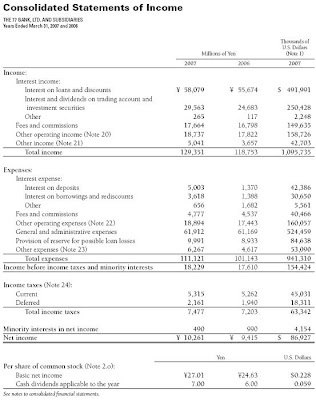 Be very wary of fast-growing hyper profitable companies (especially companies in competitive industries) where the earnings are critically dependent on a reserve or variable that has to be estimated and on which the estimate is really a guess. This could be lending or insurance or large contract construction with contract warranties or in this case an oil company. The company in question is Northern Oil and Gas (Northern): a member of the S&P mid-cap index. Northern Oil and Gas (and its little sister company Voyager Oil) own acreage and part shares in oil wells in the Bakken Shale. The Bakken Shale is one of the hotter properties in North America and is the subject of much promotion including several (sometimes anonymous) stock promotion blogs dedicated entirely to investing in the Bakken (see here, and here). Some have go-go names like “Million Dollar Way” appealing to relatively unsophisticated investors. 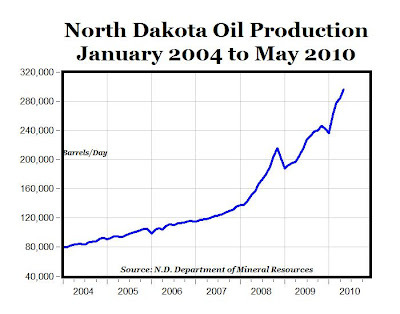 That said - the Bakken is a real oil field and it has real players and is producing a lot of oil. The Bakken is a large (200 thousand square miles) mid depth (typically about 10 thousand feet) and not very wide (typically about 40 feet wide) oil bearing shale deposit. The area overlaps two American States (North Dakota and Montana) and one Canadian Province (Saskatchewan). The field has been known about for many years because traditional oil fields underlie the Bakken and as the wells have been drilled, small quantities of light sweet crude have been logged. However the technology to extract oil in quantity from the Bakken is relatively recent and involves drilling down 10 thousand feet, kicking a horizontal well down 5-8 thousand feet, putting explosives down the well to crack the rock and then chemicals and water at very high pressure to extensively fracture the rock. And then the oil flows. 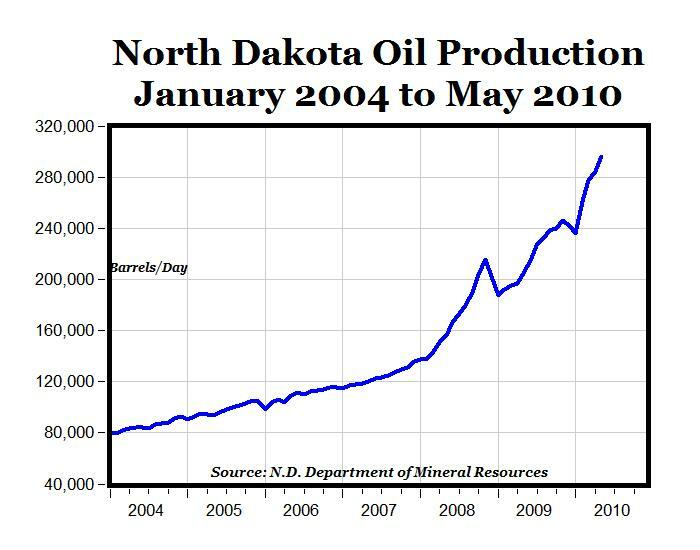 If you extrapolate graphs of production (something I don’t think you should do) then North Dakota overtakes Alaska in 2017 to be the major US oil producing state. The problem with Bakken shale oil is that the pores in the rock are tight and the rock needs to be fractured to extract it. It is a stylized fact of oil production that the tighter the rock the faster the oil well declines to a trickle - especially after the reservoir has been forcedly fractured. This makes sense. If the rock is homogenous, quite porous and extends over a large area you would expect an oil well to flow for a very long time (multiple decades). However if the rock flows only a small amount of oil without fracturing (the small amount being the amount near the well bore) then when you fracture it it will flow many small amounts (the small amounts being amounts near the fracture system). And when you have exhausted the oil that happens to be near the fracture system then the flow should flow to a trickle as the rock is not very conducive to flow. The risk with the Bakken is that the wells decline much faster than anticipated when the well is drilled and faster than anticipated in the accounts. If this happens the company will have to take a “depletion adjustment” - the analog of my subprime company taking a “reserve adjustment”. Now, also as an analog of the subprime company if the company, is drilling a whole lot of wells that are declining faster than anticipated, it can hide this through growth. After all, new wells don’t just stop flowing: they need to be old wells before that happens. And you can hide an aggregate decline problem by drilling like crazy. It just winds up being a bigger decline problem when you stop drilling. And now you see my subprime oil company: it is Northern Oil and Gas and it is a doozy. Market cap is over $1.7 billion and the stock is up from 3 and a bit dollars to almost $30 since the beginning of 2009. It is - through partners - drilling like crazy. It is a strange company, despite the large market cap it only has 11 staff. It takes minority shares in other companies oil wells. It does not drill anything itself. Every well seems to strike oil (that is what it is like in the Bakken) but because they do not operate the wells they only have limited insight into the decline rates. Shareholders have even less insight into the decline rates. I spent a lot of time trying to find a benchmark for oil-well decline rates in the Bakken. It's hard because people tend to keep this information confidential especially if they are bidding for local acreage. Also the technology to fracture Bakken wells is relatively new and so to some extent decline rates (especially over the out years) are just unknown. Still, I have heard good stories about individual wells that are flowing well after three years. I have heard horror stories about wells that are flowing at less than a barrel per day after one year. The average almost certainly lies in this range. I was getting hung up on a benchmark when one of my favorite bloggers Peter Sacha stepped in with a really useful post. In it he picked apart the accounts of Petrobakken. Petrobakken is the major player in the Saskatchewan Bakken. What is more he had a decline curve. Its only a decline curve for the first year - of production - and it is for a particularly big well (a seven stage frac). However, the initial flow rate was almost 250 barrels of oil per day and after 12 months this had declined to 75 barrels per day. It is a steep decline. 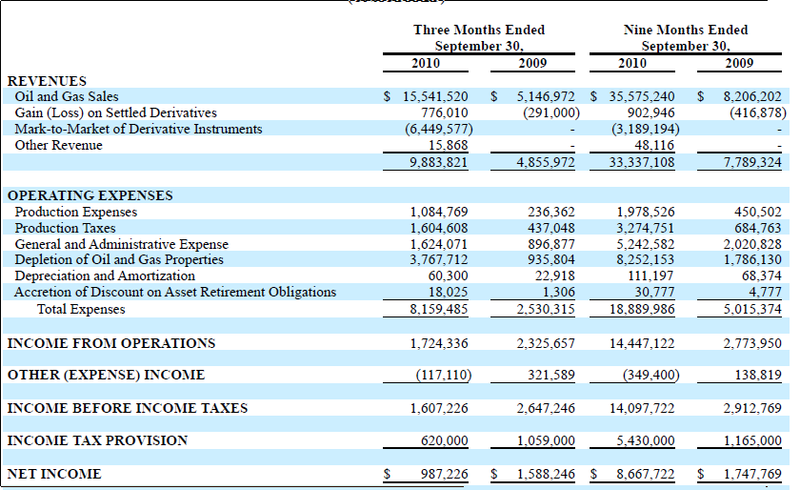 And it shows in Petrobakken’s accounts. Peter Sacha deadpans that the company likes to report “cash flow” which does not include the depletion allowance for wells. He then notes the company spent $812 million in capex most of which was to replace depleting wells. The cash flows are enormous - but the capital expenditure needed to maintain those cash flows are enormous - and that is because the depletion is rapid. The key analytical assumption of this blog post is that we can compare decline rates for Petrobakken and Northern Oil. Both Petrobakken and Northern Oil are Bakken shale producers. Petrobakken is just much bigger and a little older and a little more experienced with decline rates. But both companies have a large spread of wells in similar areas so the average decline rate (relative to current production) should be similar. 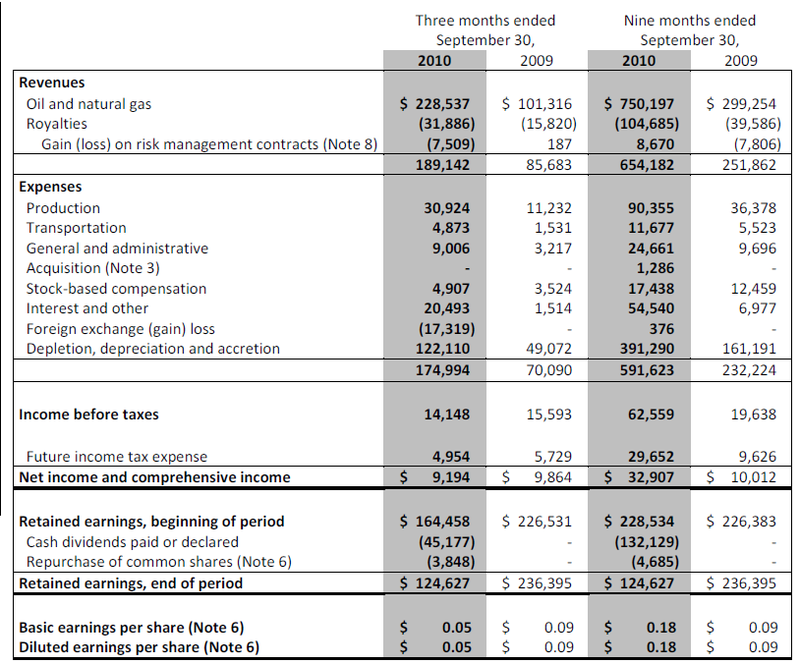 Note that over 9 months Petrobakken had 750 million in oil and gas sales before royalties and 654 million in net revenue. The depletion charge was 391 million. Depletion is 52 percent of gross revenue and almost 60 percent of net revenue. These wells deplete badly and the depletion charges are large. Here is Northern Oil for the first nine months (and sorry again you will need to click). Note that for Northern the gross revenue for the first nine months is 35.6 million (a very small fraction of Petrobakken). The depletion charge plus amortisation is 8.36 million. Depletion and depreciation is only 23.5 percent of gross revenue. Same field. Same geology. Less than half the depletion rate. Same geology, same field suggests that the right approach to compare these companies is to assume the same depletion rate for both companies. Of course which depletion rate - Northern or Petrobakken? We could assume that Northern is right and these fields could actually last a lot longer than Petrobakken thinks. In which case however you should buy Petrobakken as it will generate cash flow for years and will have already expensed the associated costs. If Northern is right don’t buy Northern - buy the company which is really earning far more than it says. Altenatively Petrobakken is right and the right depletion rate is 52 percent of gross revenue. In that case for nine months the depletion plus depreciation at Northern should not equal 8.36 million it should equal that times 52/23.5 or 18.5 million. Instead of having income from operations of 14.4 million for the nine months as per stated you have income from operations of only 4.3 million. Income after tax is just over 3 million. That is for nine months - but hey - annualize it! Oh, the market cap is over $1.7 billion. If I do the depreciation as per Petrobakken (and I see no reason why I should not) then this stock is around 400 times earnings. Obviously enough we are short. It all swings on accounting for depletion - so who certifies the accounts? All of this swings on accounting for depletion. If you use Northern’s accounting then this is a high growth high PE stock. If you use Petrobakken’s accounting this is a lower growth stock with much higher PE and less prospects. At that point I ask who is certifying the accounts? Well the auditor is Mantyla McReynolds. Have you never heard of them? Nor had I and I am a connoisseur of obscure audit firms. First I checked whether they were a local firm. No such luck. They are based in Salt Lake City and Northern Oil is based in Wayzata Minnesota. That is 1254 miles away according to Google maps. They went out of their way to find this auditor. Pacific Gold Corp - stock price 3c. GeNOsys Inc - stock price 4c. Guide Holdings Inc - which has finally gone to meet its maker (price rounds to zero). Northsight Capital Inc - 45c. Studio One Media Inc - $1.28. TC X Calibur Inc - 51c. You get the idea. We are critically dependent on an estimated accounting expense (depletion) that is low compared to the competition (the far more established Petrobakken) . Further, these estimates are certified by an auditor most associated with penny stocks. Moreover, that auditor was chosen despite being over a thousand miles away and having no obvious expertise in oil and gas. You can imagine that all this made me uncomfortable with the stock. Alas Melissa Davis (at the Street Sweeper) has found far more about the stock than me. And none of it raises my comfort level. Remember my issue here is the accounting for depletion. The whole valuation, indeed the whole story swings on the depletion numbers, and Petrobakken gives you a good reason to doubt the depletion numbers. NOG appointed a new CFO early last year, records show, promoting former Vice President of Operations Chad Winter to that important post despite his apparent lack of credentials for the job. Winter has never registered as a certified public accountant in NOG’s home state of Minnesota, records indicate, and (unlike the company’s other leaders) has in fact never even reported that he holds a college degree. Even so, filings show, Winter fills three key positions at NOG – CFO, principal financial officer and principal accounting officer – that are regularly assumed by CPAs, with established records of experience and training, at other companies. This guy looks like the least experienced guy ever to be appointed to all the finance positions at a nearly $2 billion oil and gas company. I think I can stay worried about the depletion numbers. Short seems a reasonable bet to me. PS. The Street Sweeper suggests there is a Part II. I look forward with anticipation as they found plenty of stuff I did not know about this stock. China Agritech: How should I reply to Kevin Theiss re China Agritech? Forgive me a brief gloat about a successful short. China Agritech has fired its auditor after the auditor threatened to resign. NASDAQ has suspended the stock and there is no indication of when it will trade again. The Carlyle representative on the board (Anne Wang) has resigned and never answered any email I sent her or any questions on this blog. The auditor firing 8K is a gem. Ernst & Young has recommended the "initiation of an independent investigation, in order to verify certain transactions and balances recorded on the Company’s financial statements and records for the year ended December 31, 2010." E&Y also "orally advised the Audit Committee that it may not be able to rely on management’s representations based on the issues identified." In other words they thought management may be lying and they thought an "independent investigation" (meaning independent of the board) was warranted. None of this should be a surprise to any reader of this blog. I also annoyed China Agritech's management especially because of my repeated (and unsuccessful) attempts to talk to Carlyle. This is a letter I got from their PR flack on 24 February. How should I respond? Note that the flack (Kevin Theiss) says we (meaning Grayling - not China Agritech) have collected evidence that my allegations were groundless. We are aware that you have published a series of blog articles to negatively comment on China Agritech's business operations and attack the Company's credibility. It is becoming more alarming that you have repeatedly reached out to our largest outside shareholder. Your intention and ongoing efforts to derail our well-established, long-term relationship with our largest shareholder has come to our full attention. If you have any questions, concerns or comments, we welcome you to contact China Agritech’s management directly. We will provide you with our timely answers. Lastly, we have collected evidence that your allegations are groundless. If you continue to harass our shareholder, we will take further legal action against you. E-mail kevin.theiss@grayling.comE-mail kevin.theiss@grayling.comFollow Grayling NY:On Facebook at Grayling NYOn Twitter at www.twitter.com/GraylingNYGrayling is a global Investor Relations, Public Relations, Public Affairs and Events consultancy. We have offices in 70 locations, in 40 countries across Europe, the US, the Middle East and Asia Pacific. We are the second largest independent PR firm in the world. Grayling is part of Huntsworth plc. PS. Huntsworth PLC - the company that ultimately threatened to sue me on behalf of China Agritech - is publicly listed. Their CEO states on their website that Huntsworth "have developed a culture of rigorous focus on margin improvement throughout the Group". Is there any business not worth doing for a high margin? Does this letter represent the quality of their work? Brian Cox leaves me gob smacked. 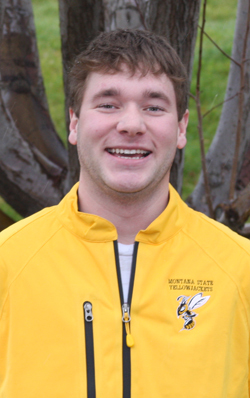 He is blisteringly smart but wears it with an easy rock-star charm. (Before he was a top-flight Physics Professor he was literally a pop star with chart topping hits.) His Einstein for beginners book is fabulous and even comprehensible (at least I think I get it). His (less demanding) BBC series Wonders of the Solar System is one of the best bits of popular science I have seen. If you have never seen Brian Cox you will need a little guide - otherwise jump to the second video - a fabulous spoof. Hat-tip: Brian Cox's Facebook feed. About 30 percent of Bronte's portfolio is shorting frauds. We are very good at identifying frauds: we are experienced and diligent. Alas some members of the fourth estate – often those with high profile mastheads – have no idea what they are doing. This article: “Danger danger, thinking of investing in a hedge fund. Here are some tips for sniffing out potential fraud” is so misguided as to be comical. Do not invest in a fund where the fund manager has access to your assets. Ok – that needs a little explaining but its not complicated. If – as an American - you invest in Bronte Capital you don't give us the money. We are not even legally allowed to take it. You send the money to Citco. Citco is the world's largest hedge fund outsource company – but there are alternatives. David Einhorn's Greenlight Capital uses one of the bigger banks. There are smaller players such as Spectrum, Conifer and others. When you send the money to Citco they hold the assets. We just trade them by issuing instructions to brokers. However if we asked Citco to send the money to our personal bank account they would (rightly) refuse. Moreover Citco value our assets every month and they – not us – send the statements to the clients. We don't do the valuation so we can't fake it. We don't hold the assets so we can't steal them. Private clients surprisingly don't get this. One of my friends runs a successful (albeit small) fund from his home. People regularly make out checks out to him. (If you send us money we will say thank you and send it back...) The core due diligence test is simply not understood by retail clients – and alas the Wall Street Journal perpetuates their ignorance. And guess who was the custodian for the assets invested in Bernie Madoff's fund. BMIS – and that stood for Bernie Madoff Investment Securities. And Bayou- another large fraud. Well Bayou of course. How about Astarra – the fraud I exposed in Australia. Well their custodian was Trio Capital – a small custodian in the rural Australian town of Albury. And guess what – Trio and Astarra had the same owners! What about New World Capital Management – a fraud I wrote up but which was never prosecuted: well the perpetrator himself of course. I could go on and on and on. It is really easy to spot frauds and the fact they keep reappearing is testament to people not having a clue how to look for one. If you do this you are unlikely to get fleeced. Simple as that. The Fund Came to You: The Fund Came to You: While it's not unheard of for a hedge fund to approach a wealthy individual, reputable funds usually concentrate their prospecting on institutional investors, says Randy Shain, executive vice president of First Advantage Litigation Consulting, who has been looking into hedge funds for 20 years. Always ask for the names of a fund's institutional investors, then contact them to verify that they are investors and have no qualms about the fund's legitimacy. While it's not unheard of for a hedge fund to approach a wealthy individual, reputable funds usually concentrate their prospecting on institutional investors, says Randy Shain, executive vice president of First Advantage Litigation Consulting, who has been looking into hedge funds for 20 years. Always ask for the names of a fund's institutional investors, then contact them to verify that they are investors and have no qualms about the fund's legitimacy. Well politely – garbage. I have written before on how institutional investors are right people to contact when you want to move the fund from $500 million under management to $1.5 billion under management. They are absolutely useless at finding the hot fund manager with $5 million under management on their way to five years of 30 plus percent returns. If you used this rule you would never have invested with Warren Buffett when he ran Buffett partnership. All of the Buffett biographies make clear he approached well-to-do people like local medical specialists. But its worse. If you invest in managers that come to you through funds of funds or institutions you will probably wind up paying double-layer fees to get something like the average of all hedge fund managers. Our initial client sent us the multi-fund manager record for a major (and successful) fund of fund. He thought this these returns were BS. I was kinder – these returns ok relative to equities over the same period – and more stable and probably ex-ante lower risk – so I believe this fund of funds has added value. But the returns are not what you get from a couple of clever guys doing smart stuff. Moreover there is a real danger in going through the institutional managers – which is that you get something that averages near the financial consensus. And being in a crowd on Wall Street feels safe but it is actually shockingly dangerous. Anyway my summary is that the number one method of choosing a fund given by Rob Curran (that is avoid one that comes to you) is counterproductive. And the number one method of proving you are not defrauded rates a very thin method in the Rob Curran article. And the Rob Curran article annoys me too – because at Bronte we are careful about trying to construct portfolios without regard to the consensus. We don't look like institutional managers (no suits). We don't sound like institutional managers (those accents). And we we don't think like institutional managers (we don't like style boxes and we will happily change styles if market conditions change). Rob Curran is telling all the WSJ readers to avoid funds like Bronte or Kerrisdale or any of the other thoughtful start-ups out there. ** And if this criticism sounds a little strident then it should be. He is defending the financial consensus and the big institutions and frankly I don't think the big institutions covered themselves with glory over the last five years. You know my view – the really good fund managers are outside the consensus. Ratbags if you will – but ratbags with risk control. Danny Loeb was a tearaway when he was younger. [The rumor is that he posted more than 100 thousand messages on chatboards under the moniker of Mr Pink.] David Einhorn might look like he is 18 (he is preternaturally young) but listen to what he says and he throws grenades. (Who can forget the stoushes with Allied Capital and Lehman Brothers?) And these guys are really smart. And I guess if you want to chose a hedge fund and you don't want to work too hard you could ring them up. In the mutual fund space my old boss at Platinum in Australia is far less out-there than those two but he is super-smart and he is not afraid to have people disagree with him. So how do you chose a smaller manager? Well first remember my test: do they hold the assets themselves of give them to a reputable third party to hold. Don't forget this rule – it solves almost everything. Then ask how they get the returns. Leverage levels matter (they should be low – but 120 long 40 short is probably less risky than just 100 long). Position size matters. Short positions should generally be small (or using other mechanisms that limit risk like shorting debt rather than equity). Long positions can be (much) larger. Finally there is a test which I do (and which has enabled me to see many frauds) but that is seldom done elsewhere. Match the stated returns to the ex-ante stated positioning. For example I have disclosed several times on this blog that I am interested in shorting fraudulent Chinese stocks. It should then come as no surprise that we are doing (very) well this month. The Bank of America position wasn't the only reason for the dud-period in the middle. We are a global fund and measure ourself in US dollars. The US dollar appreciated sharply through that period (devaluing our largish Euro denominated positions). We quite explicitly generally do not hedge currency so you would expect to see currency volatility in our returns. We also had a position in Maguire Preferred (now MPG Preferred) which gave us a wild though profitable ride. More to the point – this was done primarily with big cap long positions (and small profitable positions in some defaulted preferred securities) and highly diversified and usually small cap shorts. The positioning is as explained in my lament post. Finally I have some strong views about prime brokers. You should use only funds with US domiciled prime brokers for the reasons outlined in this post. In other words it is pretty easy to do due diligence on us. Incidentally the question we are asked almost all the time is "how much money do you manage?" The implication that you need to be large to be good. I assure you in almost every case returns are negatively correlated to funds under management. You want the answer to be low - another inversion of the normal presumption. Large however is the comfort of crowds - a comfort misplaced in markets. 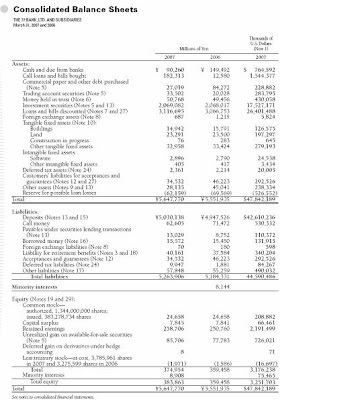 Here are the steps generalized for any small gun hedge fund manager you might want. Step 1: Check the independence of the asset custodian. This is a black-and-white test. Any gray in the answer then the fund fails. Period. Actually if it fails email enforcement@sec.gov and see if you can get bounties for spotting it. Step 2: Are they smart? Test them on some industry. Bring an expert if you have one. Otherwise carefully read their material. Step 3: Do they keep the position size and the leverage low enough to be safe? Shorts must be smaller than longs. 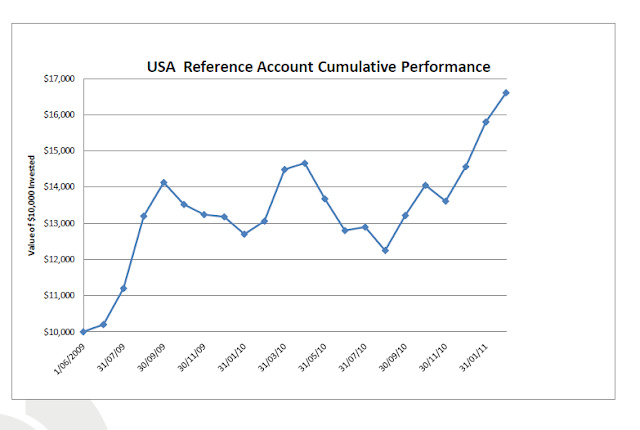 Step 4: Do their returns correlate with what they say? Focus on the particularly good months and the flat months. Step 5: Is their brokerage arrangement sound (especially do they use US domiciled prime brokers). And if you are a rich guy and they ring you out of the blue. They are either trying to steal from you or they are being entrepreneurial. Entrepreneurial is good – sometimes very good. Follow the above steps and you will sort the wheat from chaff. Is it too much to ask the Wall Street Journal to do the article properly next time? *If you ring the custodian at a phone number provided by the money manager you could find yourself talking to a Potemkin custodian – just as people who rang advertising agencies at phone numbers provided by CCME would up talking to Potemkin advertising agencies. No kidding. When someone gives you a reference do not ring the number they give you – ring the switchboard of the company they work at. Always. **Kerrisdale is far more aggressive than Bronte. Their returns are better too. But I have wondered openly whether aggression and risk are actually that well correlated - and I would use them as a case example. I have conducted none of the tests described here on Kerrisdale. I met Hank Greenberg in late 2000. He was chatting mostly to Ajit Jain – the Berkshire Hathaway reinsurance impresario and I was a spare wheel. But Hank was I thought the most impressive person I had ever met. He name-dropped shamelessly (he had had just flown back to New York on a private jet after “chatting” with Li Peng). But he was so far ahead of me on so many issues it made me feel dumb. He even looked – at least in the brief conversation – as if he were considerably smarter than Ajit Jain – and Ajit is no intellectual slouch. Anyway there is a view around AIG – a view that I shared – that AIG was built in the mold of Hank and it required Hank – a certified genius and an unbelievable workaholic – to keep it all together. AIG you see had a single risk control mechanism: Hank. In this view Elliot Spitzer by causing the demise of Hank Greenberg caused the demise of AIG – and by extension the demise of the entire financial system. I thought that might be going a bit far – but it is hard to argue against the proposition that AIG got much more risky without Hank around. And the stories were legion too. I know someone who was on a trading floor for AIG in Taiwan. There was a big error and it potentially exposed AIG to hundreds of millions in losses. Everyone was kept silent because if it leaked then people would front-run AIG closing their position and thus increasing their losses. People slept at their desks. But the next morning – fresh off the private jet from New York – there was Hank. He had come to take control of the situation – and he stood behind traders as they solved the problems for minimum losses. Now Hank is only a couple of percent the man he used to be. His multi-billion dollar holding of AIG has been reduced to its last few hundred million. His main asset is Starr Asia – a holding company for a variety of Asian investments (and some old AIG stock). It was through Starr that Hank made his investment in China Media Express (CCME). At peak Starr's investment in CCME was worth over $60 million. This is nothing to the Hank of old – but the new diminished Hank probably thinks that $60 million is a lot of money. It might even be a reasonable proportion of Hank's fortune. As recently as January 2010 Starr dropped another $30 million into CCME. And by that time CCME was a controversial company. I wrote that China Media Express was either (a) one of the best businesses in the history of capitalism or (b) one of the most brazen frauds in the history of capitalism. Given the auditor has resigned and is suggesting fraud, the company is suspended and well – all sorts of other ugliness – we know which now. It was one of the most brazen frauds in the history of capitalism. And we know who was the biggest victim: Hank Greenberg. And given Hank's much diminished status this was not chump change. It was a meaningful hit. 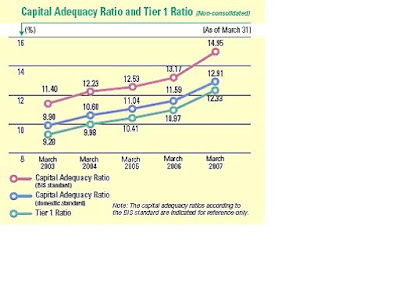 If your one-man-risk-control unit can be fooled by something so obvious then why couldn't it also be fooled by someone offering 25 bps extra carry by double-levering life insurance statutory funds into the AAA strips of subprime securitizations? China Media Express – apart from being a really fun story – punctures the last Hank Greenberg myth – a myth that I personally believed. PS. I think we can conclude that Ajit Jain really was the most impressive person at that table. I sure as hell wasn't. The second substantive post on this blog was about 77 Bank - a bank in Sendai - the capital of Miyagi Prefecture. This is the epicenter of the Tsunami/Earthquake damage. The original post - like this blog at the time - probably had less than 20 readers. I have repeat the post below. Warren Buffett once said that Fannie Mae had more supercatastrophe risk in it than Berkshire Hathaway. He figured the really really big hurricane or earthquake could do more damage to Fannie than Berkshire even though Berkshire is the largest supercat insurer in the world. Buffett was - I suspect - right. We now unfortunately have a gruesome test of Buffett statement on finance and supercatastrophe. There is probably more uninsured damage in the destruction of North East Japan than in any other event in history - and uninsured damage falls sharply on banks. 77 Bank - deeply concentrated in the disaster zone - is the test. It is not a test I would want to repeat. But I think we will - at the end of this - be able to confirm Buffett's observation that banks don't like supercats.